Growing up in Williamsburg, Virginia, my family and I always took a drive to Colonial Williamsburg and the nearby Jamestown Settlement during the holidays. We’d go see costumed interpreters at Jamestown butcher a hog with reproduction 17th-century knives, and then stroll the cobblestone streets of Colonial Williamsburg pointing out holiday decorations fashioned from local period materials like magnolia leaves, cotton, and oyster shells. In the wintertime, the blunt scent of wood smoke wafted from the historic areas directly to our front porch. As a southern-raised daughter of Michiganders, most of what I knew about Michigan history (according to my mom’s fourth-grade memories) was that ancient glaciers are responsible for the topography of the state, and special boats shipped Christmas trees from the Upper Peninsula to Chicago. If growing up in Williamsburg taught me anything, it’s the importance of knowing what happened before you. Moving up north earlier this year, I was eager to learn about the myth and romance of lumberjack adventure: people from all around the country and some from overseas trying to make their way toward some kind of fortune—literally hacking their way toward uncertain futures with axes and two-man saws. A Michigan winter conjures images of people inhaling stacks of syrup-soaked flapjacks, snow freezing on men’s beards in the untouched morning air and, of course, the sticky, tingling scent of freshly cut pine. I discovered that the reality is, as it often is, a mix of exhaustion, desperation, joy, and sometimes a bit of success. Men scouted for patches of pine and reported back to the various lumber barons, who hired even more people to come and chop it all down. Lumber camps sprouted up all over Northern Michigan, as lumber barons had already chewed up all the pine that the East Coast had to offer. By the 1880s, this seemingly random pocket of northwoods was the focal point of an entire industry. For the lumberman, winter began in the fall. Early crews carved sleigh-paths through the woods in anticipation of the snowy days to come. The ground was still too soggy to efficiently transport the logs. They had to wait for the freeze. For some, this was merely a seasonal job; a bachelor might work for one or two years—storing up adventurous stories to tell his grandchildren—then move on to a safer vocation before starting a family. Others were immigrants working to save money to bring their families to America. There were farmers who worked the fields in the warm months and went out to the woods in the winter. A few men were allowed to bring their families along. 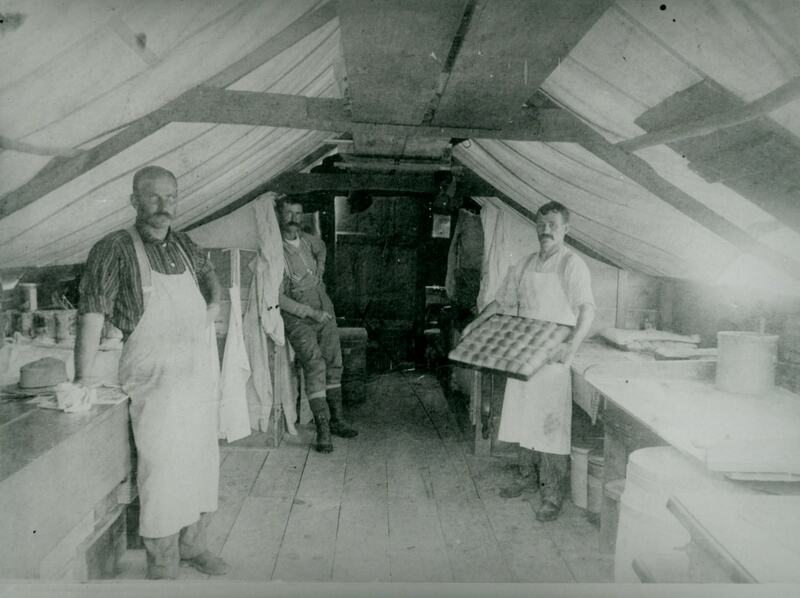 Women could work doing laundry or cooking for the camp. The lumberjacks each ate between 6,000 and 8,000 calories per day, which is comparable to the amount eaten by Olympic athletes during peak performance. Logging companies went to great lengths to ensure that their workers were well fed and ate from good quality plates and cutlery. Tin was most common, but some companies kept ceramic dishes. The philosophy was that the happier the worker, the more likely they would be to return the following season. Out in the woods, you had to be alert to any potential danger to yourself or those around you. Even then, unavoidable accidents could happen. Lumberjacks worked six days a week with Sunday as their only day of rest. They spent their free time playing games, singing together, or simply resting. “As cards are not allowed, some rough games are played. At nine o’clock the lights are put out and no noise disturbs the night’s quiet, except the snorers (by no means few) who keep up a not very agreeable concert,” wrote C.A. Harper, a Michigan lumberjack in 1882. The holiday season brought much of the same—work. 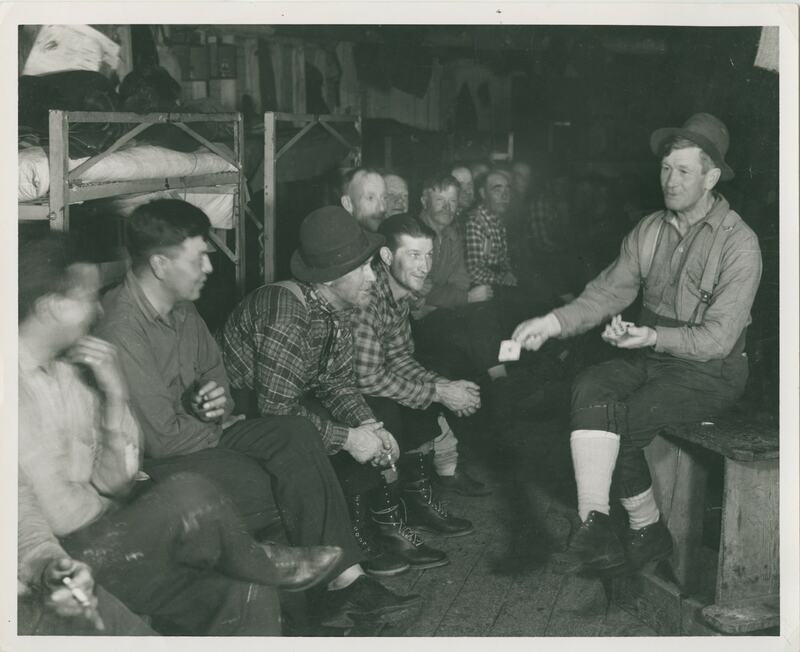 First and foremost, a lumber camp was a place of business; however, instilling morale and camaraderie was also important to the company’s success: logging is a team sport. And though the lumberjacks all came from someplace different, a well-run camp could enjoy the community and fellowship of the holidays. Unless Christmas Day fell on a Sunday, it was unlikely that they would be given the day off. Instead, their celebration came in the form of a hearty feast after the day’s work. 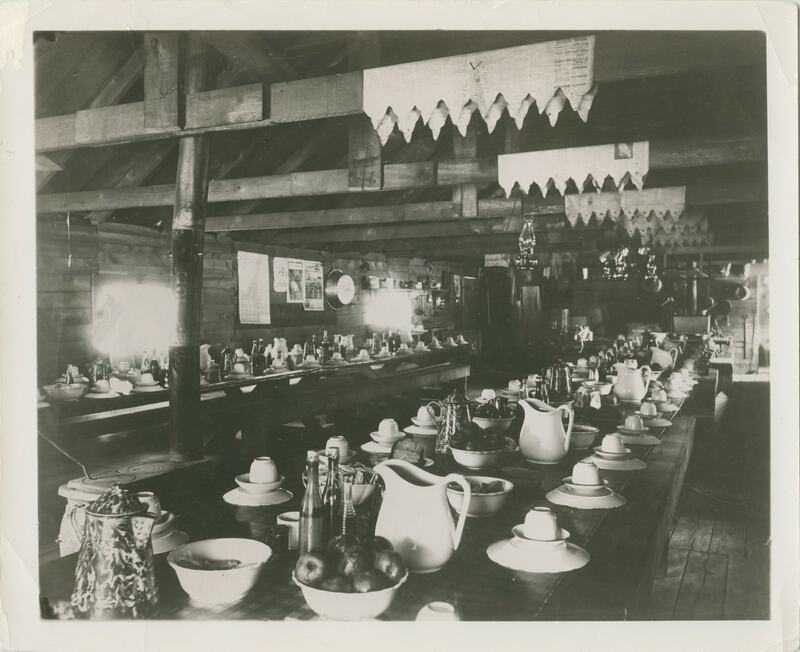 A cream soup was a particular treat as most everyday soups were broth-based, and meats would either be purchased in the local town or hunted and trapped by a company-hired hunter. A home-cooked meal is always a comfort, particularly at Christmastime. And pie is a universal enjoyment—for most of us. (And to the rest of you, thanks for the extra slice.) I leave you with a bastardization of one of my favorite quotations: “Honestly, the best pumpkin pie you ever had was probably not that much better than the worst pumpkin pie you’ve ever had.” And, in that spirit, perhaps you’ll try your hand at this modern rendition of a lumberjack’s holiday pumpkin pie. Recipe adapted from the 1887 White House Cookbook. Temperature and time not given: the writer assumes a cook reading this would already know these things. We’d suggest pouring the filling into tins lined with lard-based pie pastry, and baking the pies at 375 degrees for 45–60 minutes or until just-wiggly in the middle, but set. Molly Korroch is a journalist currently based in Suttons Bay. Visit her website at mollyhunterkorroch.com or follow her at @mollykorroch. // Photos from Archives of Michigan. // Special thanks to Historian Hillary Pine of Hartwick Pines State Park, Visitors Center & Logging Museum for providing a sample Christmas dinner—and pumpkin pie recipe—and for showing this Southerner around a beautiful Michigan park, but mostly for the wonderful coincidence of her name.